The Chart of Accounts contains a listing of the names of accounts that a company uses to record transactions in its general ledger. These accounts are broken down into balance sheet accounts (assets, liabilities, and equity) and income statement accounts (revenues, expenses, gains, and losses). Companies can expand and tailor the chart of accounts to fit their needs, such as adding accounts, as needed. Accounts can also be organized further in each category in several different ways, such as by company divisions, business functions, products, etc. It's ultimately up to you to decide what exactly you want to track, and therefore, what accounts will be used by your company. The major types of accounts are explained in a little more detail below. Assets - These accounts list the properties used in the operation of the business, such as Cash, Equipment, Receivables, etc. Liabilities - These accounts list claims by creditors to the assets of the business until they are paid, such as Payables, Mortgages, etc. Equity - These accounts list the owner's rights to the assets of the business, such as Owner's Capital Invested or Accumulated Profits or Losses since the business began. Income - These accounts list the business earnings from selling products and services, including Sales and Other Income. 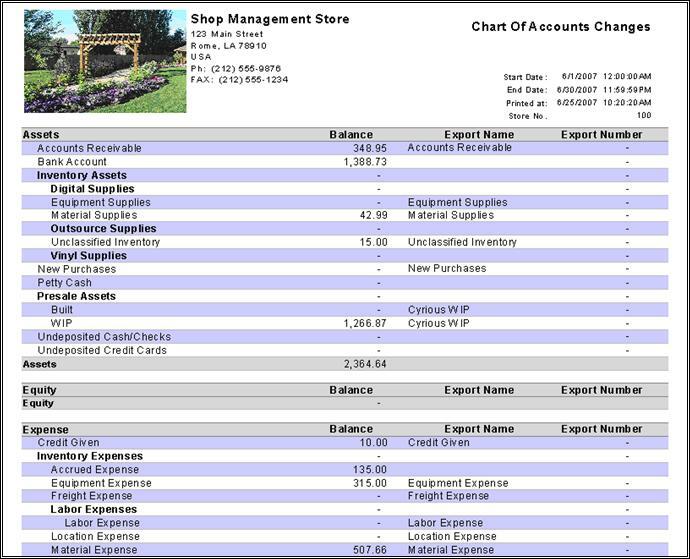 Expenses - These accounts list the cost of running the business, such as Cost of Goods Sold and Operating Expenses. Your chart of accounts can be as large and complex as you would like, or you can keep it smaller and simpler. As stated above, it will depend on what expenses and incomes you are looking to track, and how they are categorized, that will determine what accounts you use. You will also need to decide on an account structure for naming and/or numbering your accounts. There are plenty of examples to be found, and we are sure you'll find one that suits your needs. The general ledger is the main accounting record for businesses that use double-entry accounting. Each entry will affect two accounts; one account will be debited, and a different account will be credited. The transaction type will determine the accounts that are affected. This is a listing of general ledger accounts (grouped by account type, such as Assets, Equity, etc. ), the balance for that account (if applicable), the export name (an alternate name used for mapping this account into another accounting program) and the export number (like the export name, but some accounting programs use a number instead). Account Type - What type of account, i.e. Asset, Equity, etc.